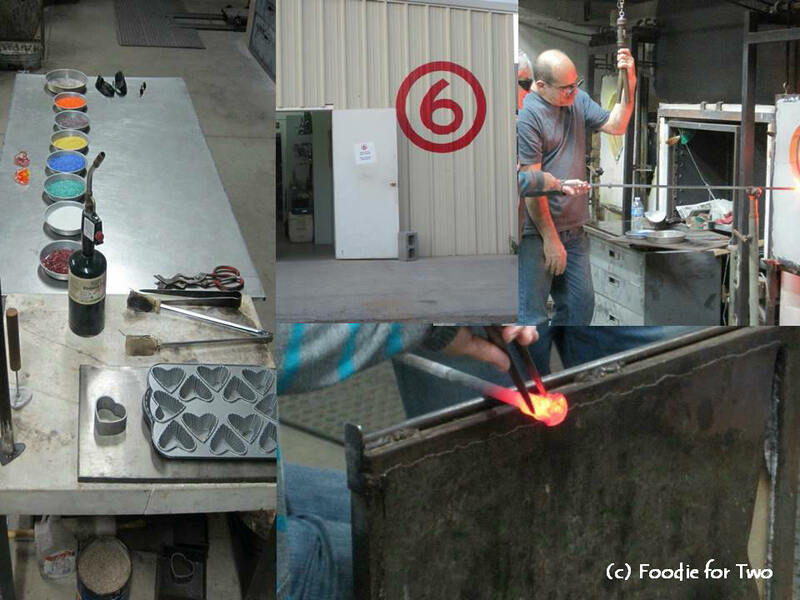 The fun didn’t end there – the next evening we attended a glass making class at Circle 6 where we made heart shaped paperweights. It was fun and scary at the same time because I was working with red-hot material (always under the protective guidance of the experts). After collecting some molten glass on the end of an iron rod, it is moved over to the always-fired-up furnace (protective eyewear required) and continuously rolled, the rod is removed and the glob is rolled in color chips, and it is heated again. Then you move to a seat so you can knead the glass a few times with large tweezers to mix the colors. The glass glob is transferred to a mold, pressed down, released and transferred to a kiln to fire. It was a blast. Mom and I actually swapped paperweights because I liked how her colors came out better than mine. It’s now on my desk at work as a reminder of my visit. Now, back to our Sunday Super Bowl menu ………. Our first course was an incredible salad of Baby Greens with Warm Brie & Apples (adapted from Barefoot Contessa recipe). 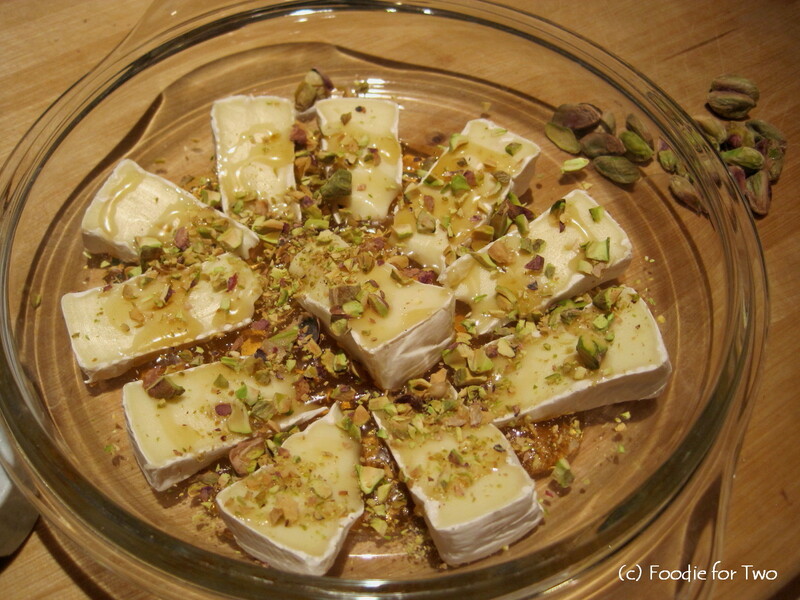 It’s easy to put together with brie wedges that are drizzled with honey and chopped pistachios, then heated in the oven until soft and almost oozing. 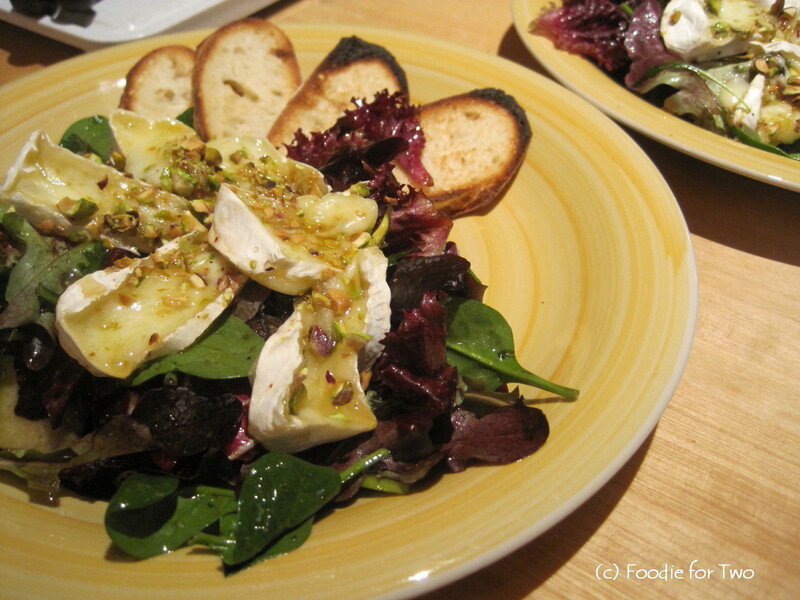 The baby greens are simply dressed with olive oil, balsamic vinegar, sea salt and pepper, and the warm cheese tops the salad. Toasted French bread slices make for the perfect scoops and add just the right crunch. 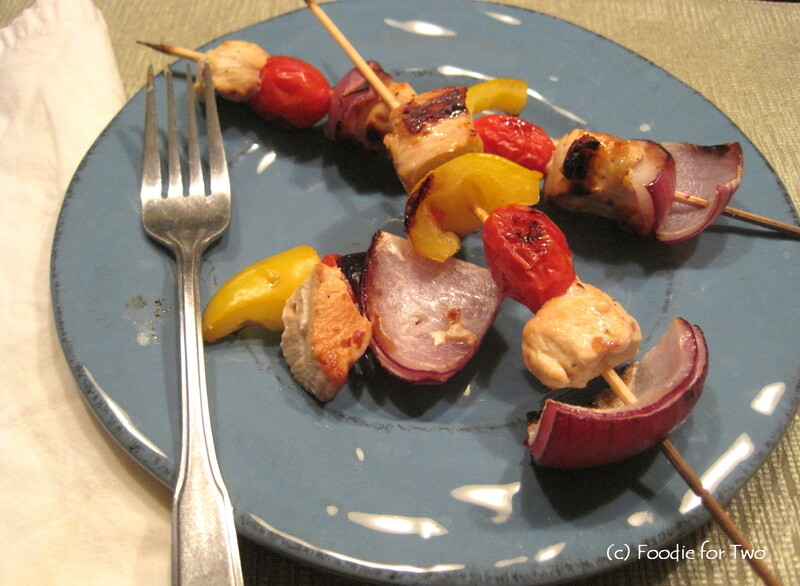 Dinner was simple with chicken and vegetable (yellow bell pepper, red onion and cherub cherry tomatoes) skewers. We marinated the chicken in a mixture of olive oil, white wine, honey, garlic, salt and pepper. 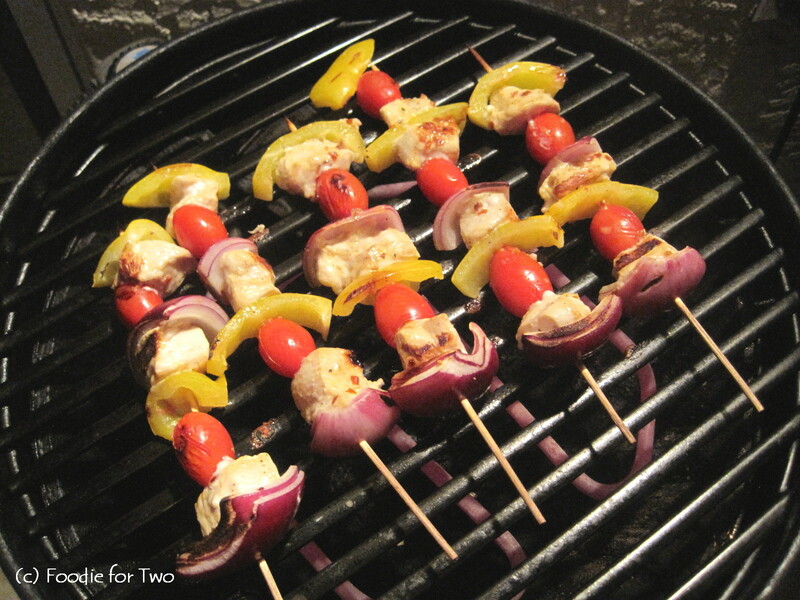 After we were done assembling the skewers, the sauce was drizzled over for extra flavor while cooking. It was delicious and the perfect light finish to the meal. 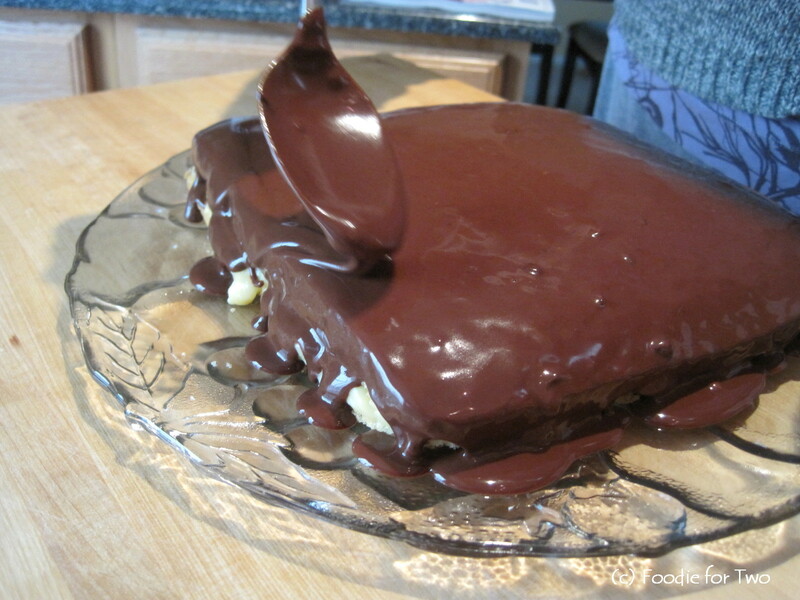 My childhood favorite dessert is Boston Cream Pie and Mom makes the best! In fact, it was usually my birthday cake when I was a kid. Straight from the Betty Crocker cookbook, it is a white cake filled with homemade vanilla pudding and topped with a thick chocolate icing. It is a treat for me because I can’t seem to make the cake at this altitude, so it’s not often that I get to enjoy it. I wish I could dig into a piece right now! 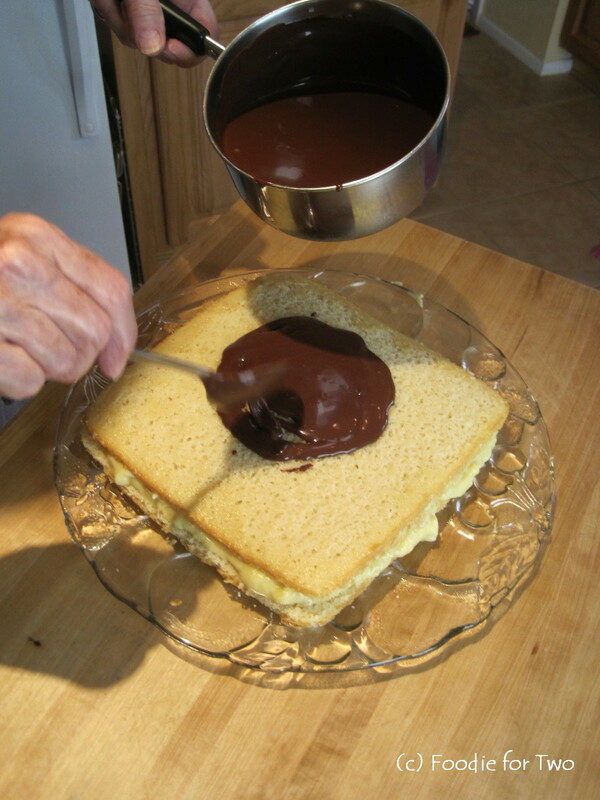 Here are some action shots of Mom adding the homemade pudding to the cake (above), and covering it with chocolate goodness (below). Preheat oven to 375 degrees and line 2 baking sheets with parchment paper. In a large saucepan, bring water, butter, and salt to a rapid, rolling boil. 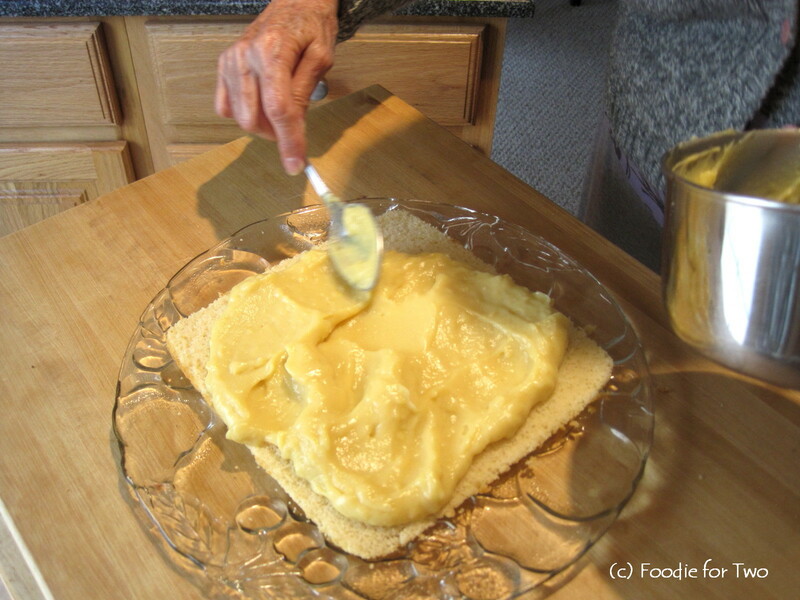 Make sure all the butter is melted, and then add flour. Stir the mixture for 20-30 seconds, until a sticky dough ball forms and begins pulling away from the sides of the pan. Reduce heat to low-medium heat and cook, stirring, for 90 seconds. Remove from heat and set aside for 5 minutes. Beat in eggs, one at a time, along with cheeses, seasonings and rosemary. Place heaping teaspoonfuls onto prepared baking sheets, 1 inch apart. Bake for 25-30 minutes, rotating sheets halfway through. 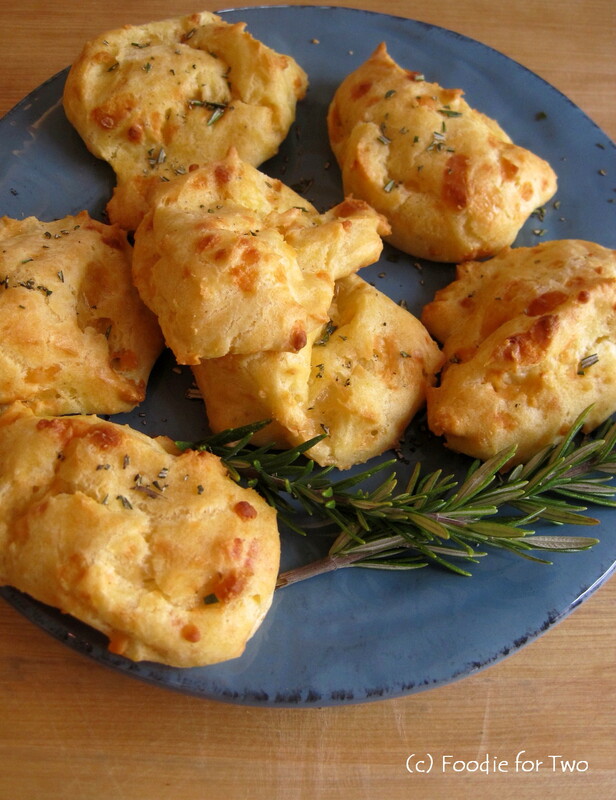 The gougeres are done when they are a deep golden brown and puffed. Sprinkle with chopped rosemary and serve immediately. 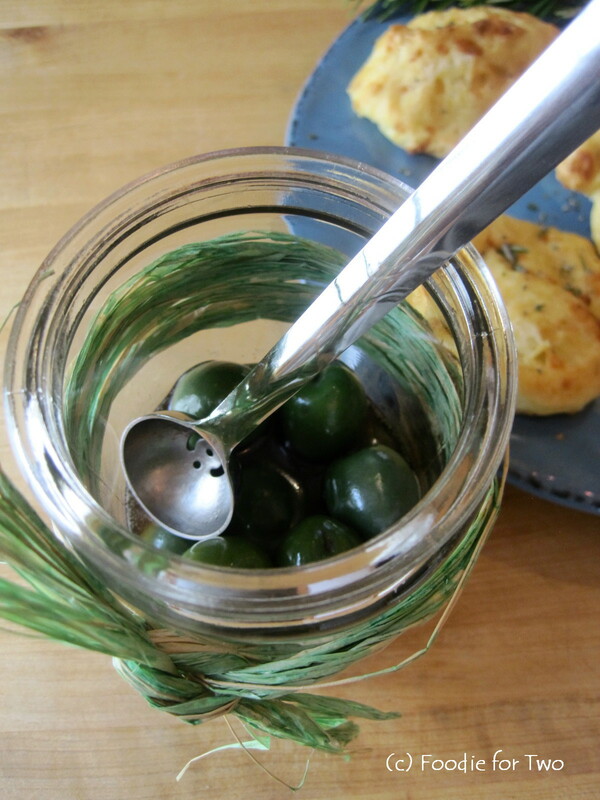 A surprise gift from Mom – a beautiful jar filled with Castelvetrano olives and an olive spoon attached! There’s reason for celebration because my batch of homemade limoncello is ready, just in time for David’s birthday! 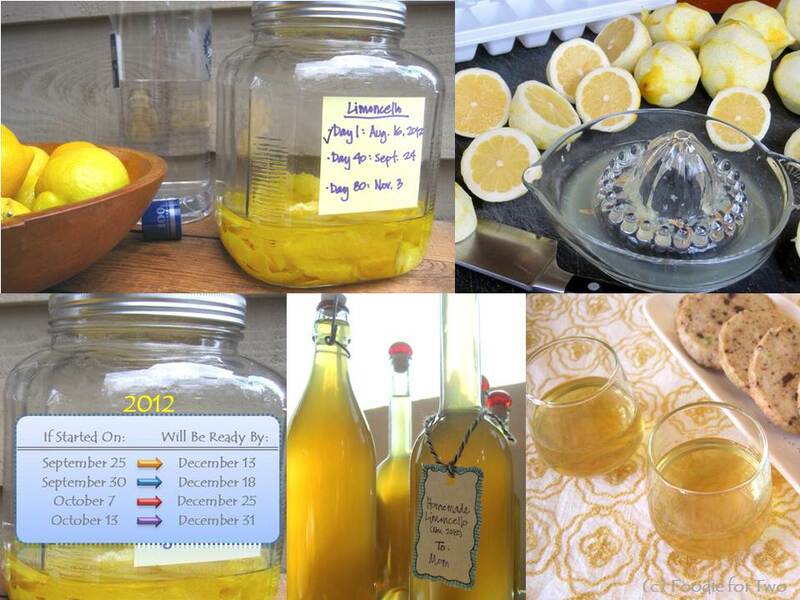 I started the limoncello on August 16th and it was ready last Saturday (November 3). The recipe is from Joanne Weir and takes 80 days to cure. Made from lemon peels, 2 bottles of 100-proof vodka and some simple syrup, this limoncello recipe is easy to make, yielding crisp and bright flavors. My Mom has been making it for years so it was fun to carry on the tradition with my first batch here. An Italian classic, limoncello is served ice cold and sipped after dinner. 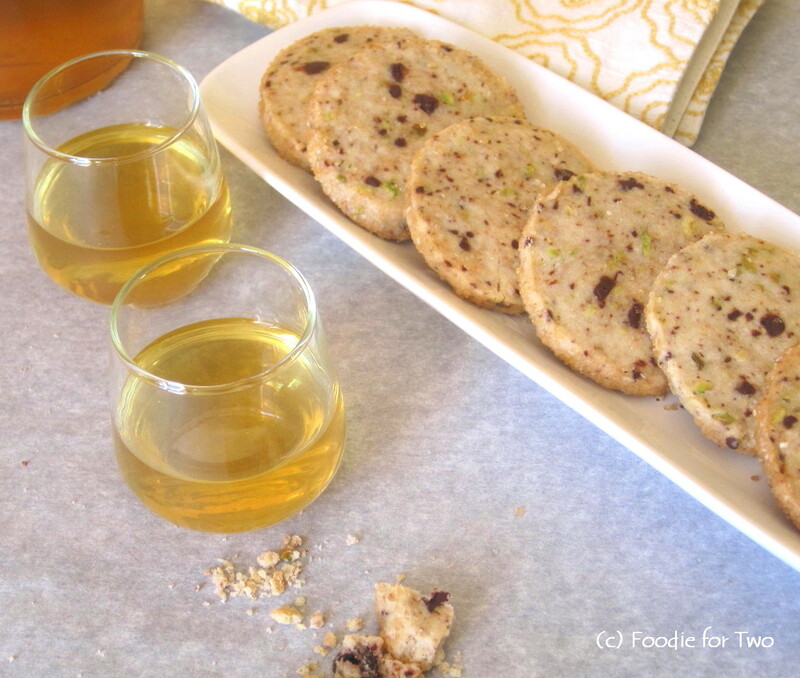 I made pistachio chocolate chip shortbread cookies for something decadent and sweet. They offer a buttery, rich texture and pair well with the lemony, smooth alcohol. The shortbread cookie recipe is from Martha Stewart, with an added 1/3 cup each of the nuts and 60% cacao chocolate chips, both chopped. Be sure to roll the cookie sides in sugar (used turbinado for texture). Speaking of sugar, you may remember from the Day 40 post that I used organic sugar in the simple syrup, which changed the color from the usual light golden (as shown here with Mom’s May vintage) to a tea color. Thankfully the color lightened considerably, but it is still darker than normal. I’m happy to report that the flavor is uncompromised. The recipe yields 12 cups of lemony goodness. 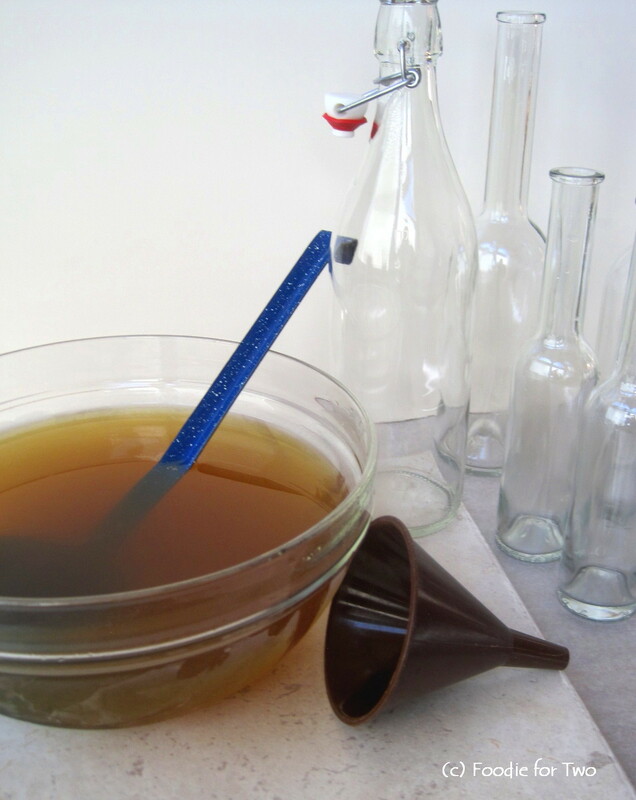 To make the bottle filing easier, ladle the limoncello into a measuring cup with a spout, place a medium funnel in the bottle and pour slowly, leaving an inch of space at the top. I found the long neck (small and large) limoncello bottles with red-capped corks at World Market; they also sell bottles with a clamp stopper, shown here. Pier1 has some vintage-looking bottles with corks, and Amazon sells the clamp stopper bottles, plus more. Store the bottled limoncello in the freezer. Done! 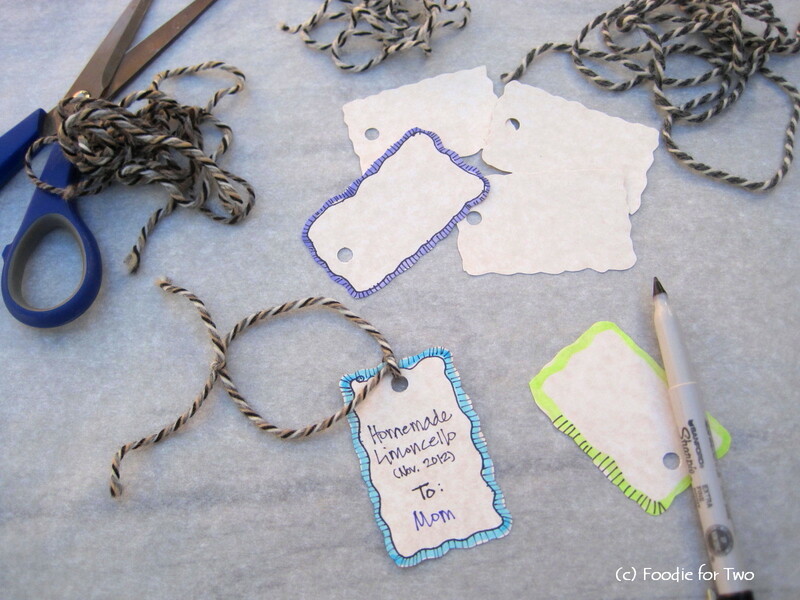 Bottle tags are ready for use. 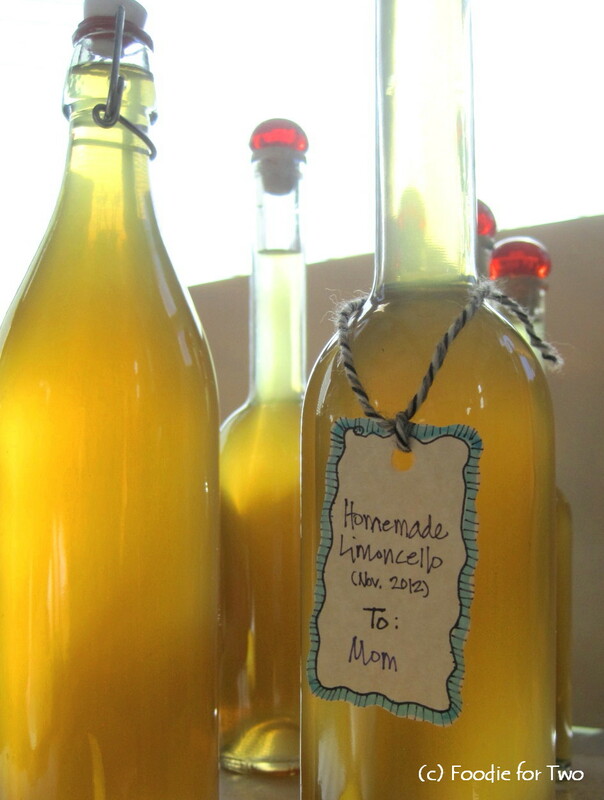 I believe a few friends have made a batch of limoncello after I posted and would love to hear how theirs turned out – friends, are you listening? Always love it when you share. How about you, did you start a batch, or have you made some before? 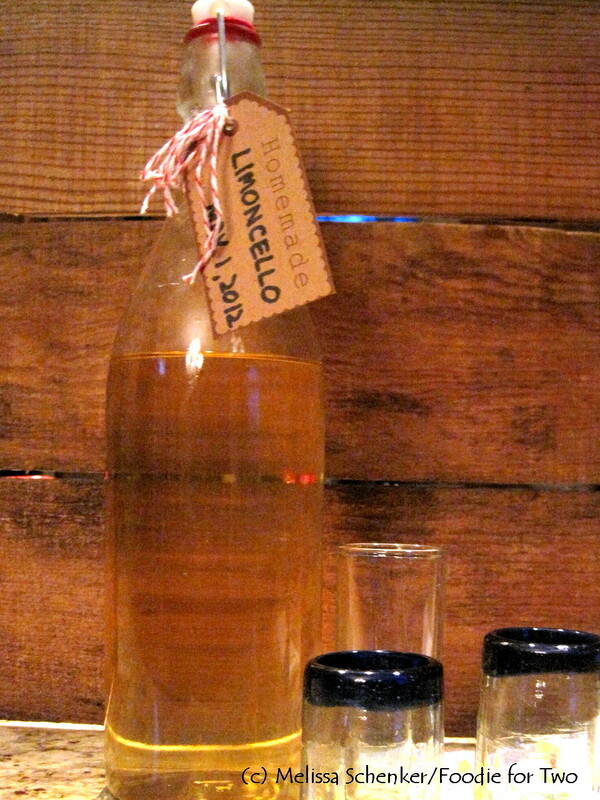 Not just for the holidays, limoncello is wonderful on Valentine’s Day, for birthdays (including yours!) or just because. Do make some, and please share. Cheers, and Happy Birthday to my man! My mind is distracted and I feel paralyzed to do anything productive. It is only the end of March and we are already in high fire danger, which is incredible considering we’ve had over 8 feet of snow in our area since October (remember we were sledding through the snow on our property in January?). I find myself checking the weather and news reports frequently and I gaze out our front windows to see if the fire plumes have flared up again. On Monday a fire developed in the Lower North Fork area of Conifer, a neighboring community. 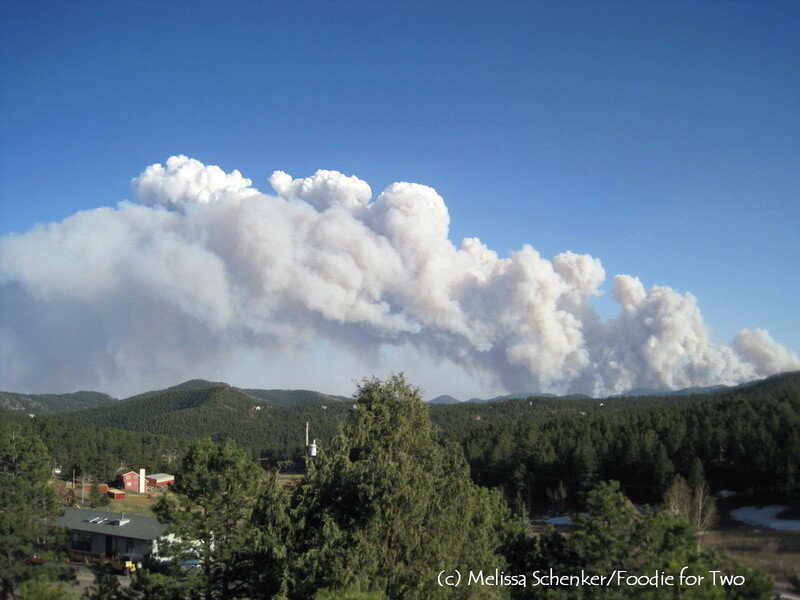 We had powerful wind gusts up to 40 mph that fueled the fire in this beautiful area of Colorado. It started as a few acres, grew to 100 acres, and by the end of the day the fire had engulfed an astonishing 3,800 acres. This was the view from our front deck on Monday afternoon; the white on the ground at the bottom right is snow! As of this afternoon, the fire is 15% contained and over 20 homes have been lost, as well as 2 people. My stomach is in knots and I feel the devastation in my soul. I can’t help but think of my neighbor’s loss, the animals and wildlife that have been displaced – or lost – and the stunning mountainsides that have been forever altered. My worry is all-consuming yet I cannot control Mother Nature. My mind is reeling from the what if questions: what if the winds pick up (they are supposed to this evening) and the embers start a new fire, what if WE have to evacuate – aside from the financial documents, computers, pictures and limited personal effects, how do we choose what to save, what if we experience more fires later in the season…..WHAT IF?!! So to calm my nerves, I turned to chocolate hoping to provide my troubled mind with some respite. Chocolate makes everything better, right? For something chocolate, I decided to modify my whoopie pie recipe for an easy, sweet treat. 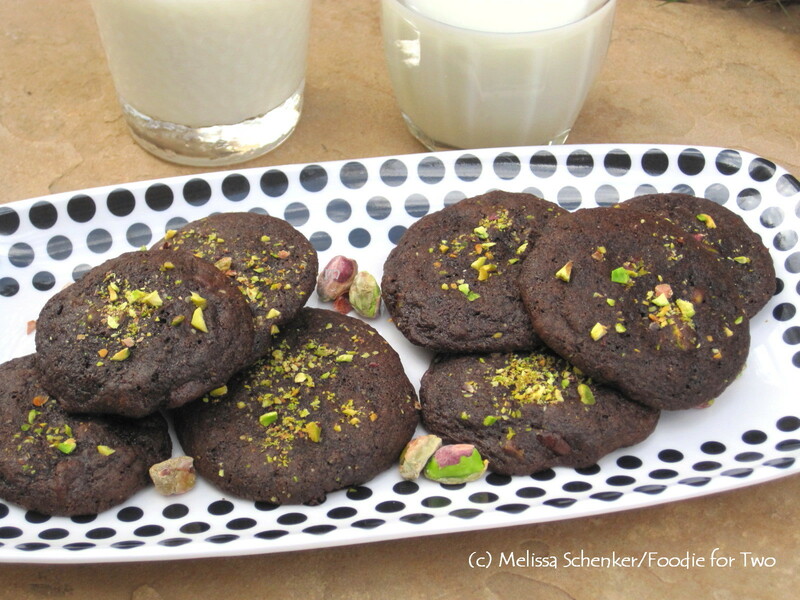 They are moist and cake-like, and the perfect companion for some pistachios and chocolate chips. There is no filling as with the whoopie pies and they are pure comfort for the mind and soul, if only for a bit. I cut the recipe in half, used coconut oil instead of shortening and made smaller cookies. 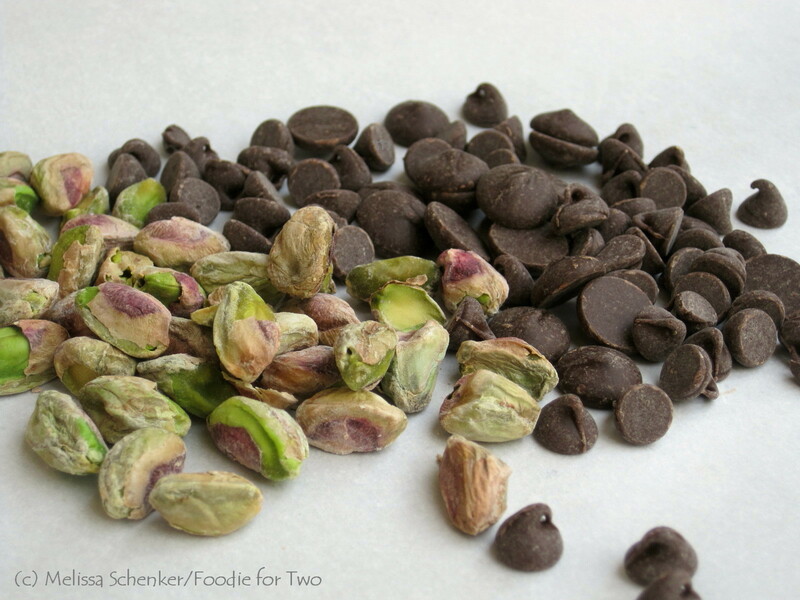 The chocolate chips add a gooey goodness and the pistachios offer a nutty crunch with some bright color on top. Delicious and just what I needed! Thanks to everyone who has called to check in on our safety, we appreciate it! For now, life goes on and we hope that the heroic fire fighters can protect our neighborhoods and quickly get this fire under control. We are in for a long fire season, which forces us to face reality and prepare ourselves and our home with an evacuation plan. Our thoughts are with the families who have been affected by this tragic fire. On a much lighter note: I’ve been nominated! Saveur magazine is currently accepting nominations for the best food blog awards. Nominate your favorite blog today (click here) – Hurry, the deadline for entries is March 29 and the winners will be announced April 5! Dry Ingredients: Sift the flour, cocoa powders, baking soda and baking powder into a medium bowl or glass measuring cup and add the salt. If you don’t have a sifter, just use a wire whisk and whisk all ingredients together until well incorporated and no lumps remain. Set aside. Batter: Line a sheet pan with parchment paper. Add the egg yolk to a large glass bowl and mix with a hand-mixer on low setting until yolk is fluffy and light yellow, about 30 seconds. Add in sugar, coconut oil and vanilla and mix on low until well blended. Turn mixer off and add in the flour mixture and milk. Blend on low until just mixed; if needed at the end, scrape down sides with a rubber spatula and gently fold batter together. Add 2 tablespoons pistachios and the chocolate chips and fold in with the spatula. Heat the oven to 375º and let the batter sit for 10 minutes – this helps the cookies have a fluffier interior and hold their lift. Using a small cookie scoop (OXO #60, 2 teaspoons) or a tablespoon, add 6 scoops of batter to the sheet pan, at least 2 inches apart, and sprinkle some chopped pistachios on top; cook for 9 minutes. Transfer cookies to a rack to cool and repeat with remaining batter. 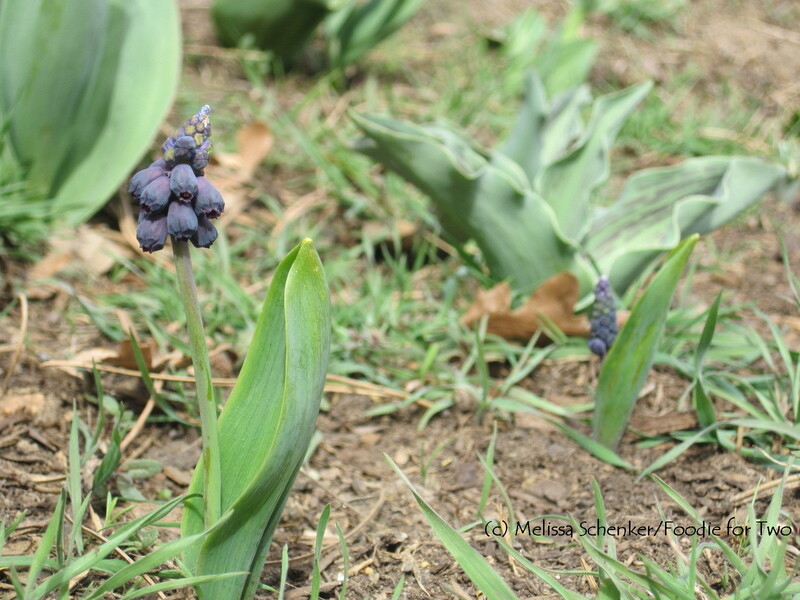 Another good distraction for me, watching my bulbs and tulips grow! I forgot to save the bulb bags and don’t remember which varieties I planted. I look forward to the surprise. When you read the appetizer section of most restaurant menus you’ll usually find crostini or bruschetta, both a delicious treat before dinner. What is the difference between the two? Crostini refers to thin slices of bread that are toasted and topped with cheese, vegetables or meat. Bruschetta refers to thick slices of bread toasted over coals or a grill, seasoned with olive oil, garlic, salt and pepper and typically topped with a tomato and basil mixture. I have combined the two and refer to these creations as crostini for simplicity. The toppings are an easy way to dress up slices of good bread. Whether it’s for you and your honey, or for a party, crostini make elegant holiday appetizers that can be prepared without much fuss. By now you probably know that I have a serious olive addiction. Not only do I love the rich and creamy black olives but also Castelvetrano olives, oil-cured olives, black Cerignola and green Cerignola olives. So it’s only fitting that an olive tapenade starts my list. This tapenade is made with black olives, Castelvetrano olives, garlic, capers, Italian parsley, extra virgin olive oil, salt and pepper. 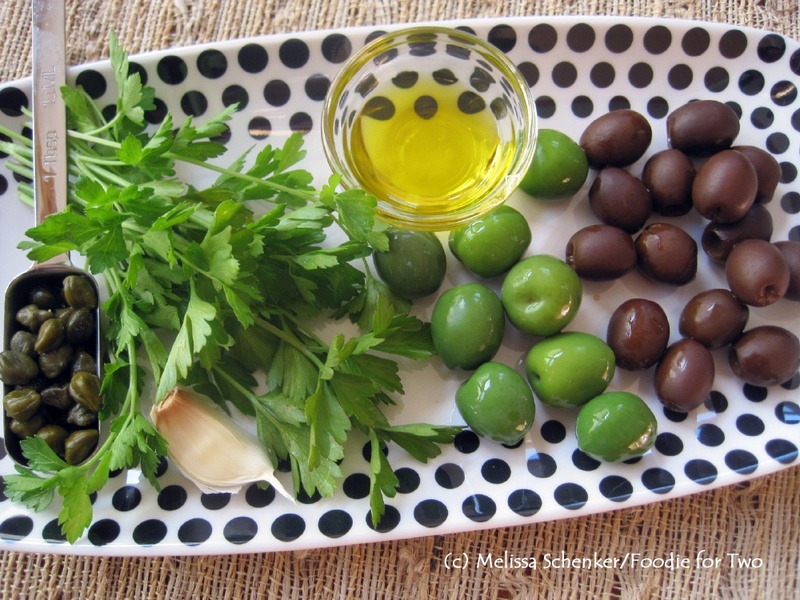 It has a wonderfully rich, nutty, briny and buttery flavor that satisfies my olive cravings. I found the Castelvetrano olives in a jar (Mezetta brand) at my grocery store; these and the other varieties can also be found in the olive bar at grocery stores or specialty stores. The tapenade will keep covered in the refrigerator for up to a week. 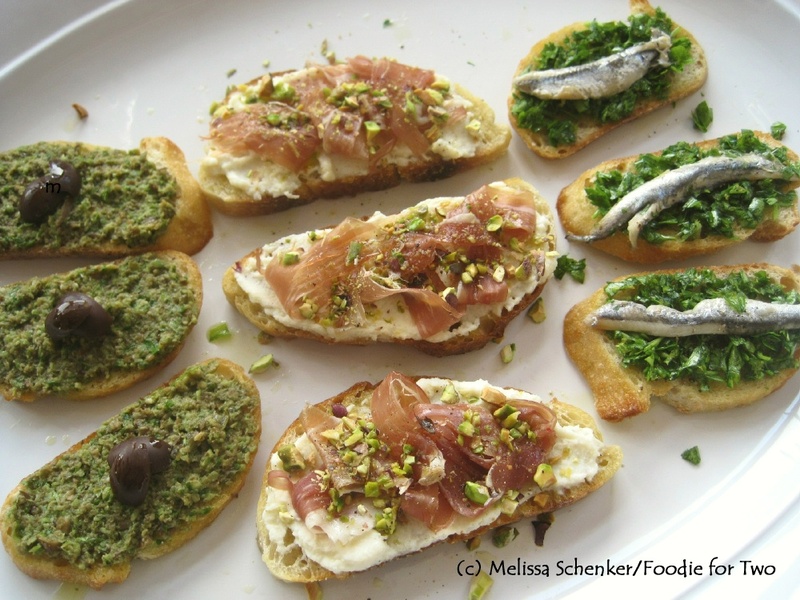 This crostini is inspired from the restaurant Postino Wine Bar in Scottsdale, thanks to my sister, Cheryl. It uses ciabatta bread as a base and the flavor combinations are unusual. To add a layer of flavor, I dress up the ricotta with some lemon zest, olive oil, nutmeg, salt and pepper. For special dishes like this I use good quality Prosciutto di Parma, which comes from the city of Parma in Italy and has a distinct, rich flavor (San Danielle prosciutto is another delicious alternative). The chopped pistachios add a salty, nutty flavor for a fantastic flavor contrast. 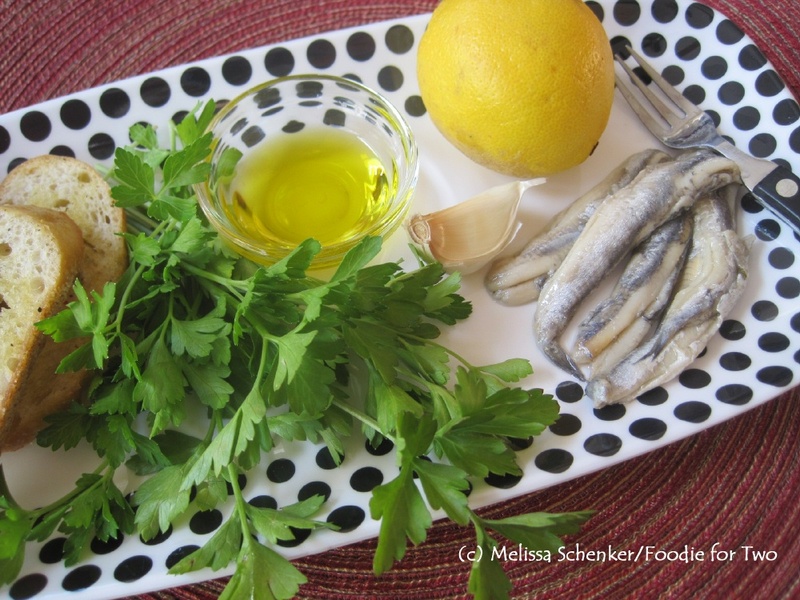 Yum – if you haven’t tried white anchovies yet you are in for a real treat. They are worth the splurge and have a plump texture with a mild fish flavor (nothing like the canned brown ones). Imported from southern Italy, they are preserved in olive oil and a bit of vinegar; you can find them in your specialty Italian markets (Denver sources: Parisi, Tony’s Market) – any leftovers can be used for a quick sauce with pasta (heat several tablespoons olive oil, add some minced garlic and white anchovies and cook until the anchovies melt into sauce; toss with linguine, or angel hair, and Italian parsley). Gremolata is usually made with parsley, garlic, lemon zest and olive oil; the herby, garlicky gremolata is the perfect companion to the rich, piquant anchovies on a toasted baguette slice. There are endless options for making crostini, so have some fun and get creative – add a glass of Prosecco or Champagne and you are ready to toast in the Holidays. Cheers! Heat oven to 375 degrees F and cut baguette and ciabatta bread into slices. Place on a sheet pan and drizzle both sides with a small amount of extra virgin olive oil and season with kosher salt and pepper. Bake in oven for 8 to 9 minutes until golden brown. Let cool before topping. Add all ingredients to a small blender and blend in intervals until smooth; stop motor in between intervals and scrape down sides. Store covered in the refrigerator – will keep for one week. Spread 2 teaspoons of tapenade on each toasted baguette slice. In a small bowl, mix together the ricotta, lemon zest, nutmeg, extra virgin olive oil, salt and pepper. 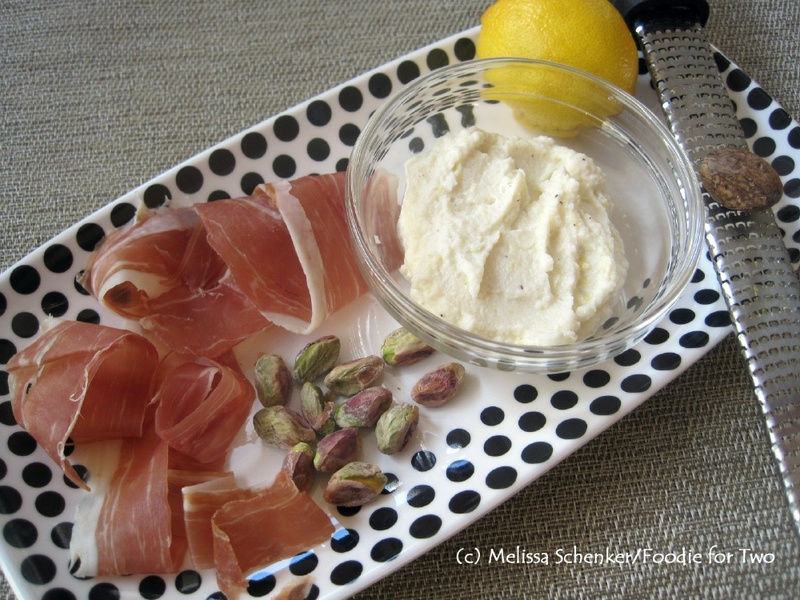 Spread one tablespoon of the ricotta mixture on each slice, add a half of a slice of prosciutto (torn into pieces), sprinkle with 1 teaspoon chopped pistachios and drizzle with extra virgin olive oil. Mix together the parsley, extra virgin olive oil, lemon zest, garlic, salt and pepper in a small bowl. 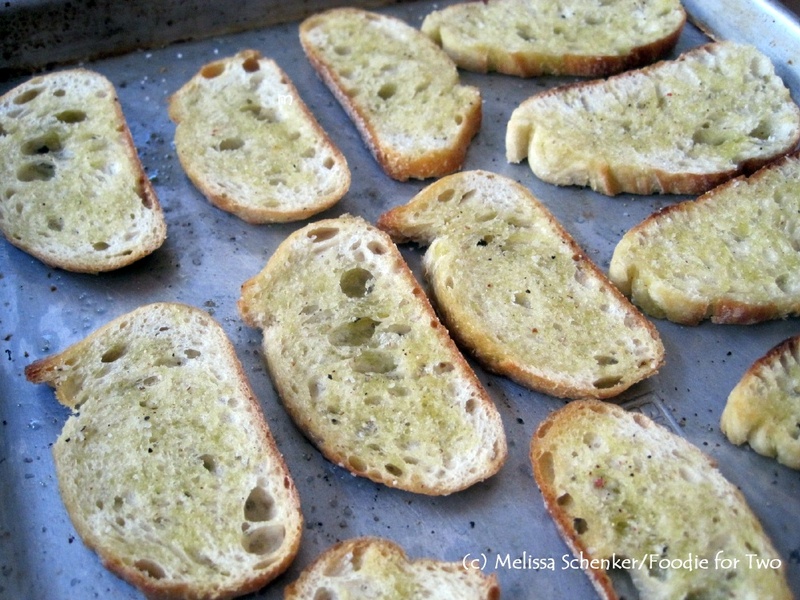 Spread 1 ½ teaspoons gremolata on each toasted baguette and top with an anchovy filet.